When I reviewed Batwoman Vol. 3, I predicted it might be the best of the bunch (or at least the last best of the bunch). That prediction has held out. Batwoman Vol. 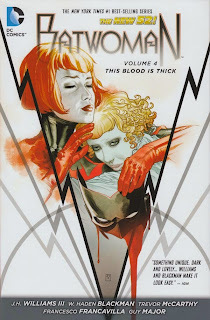 4: This Blood is Thick certainly has characterization and intrigue to spare, but the absence of JH Williams on art duties in favor of a bevy of guest-artists affects the book significantly; it is by no means bad, for the most part, but it is lesser than some of its predecessors. There's also no disguising the damaging effect that the volume's anti-climactic ending (caused by writers Williams and Hayden Blackman's sudden departure) has on the story. I imagine that for issues of royalties or general neatness, it's to DC Comics's benefit to have Williams and Blackman be Blood is Thick's sole writers, leaving incoming writer Marc Andreyko's material for the fifth volume and beyond. And I do see the value in being able to say that this volume is part of the original Williams/Blackman run and this other volume is not; the reader knows who's responsible for what, which is not always so clear in every book. But I am hard-pressed to remember a book's ending so poor, and I can't believe the difficulties of including Andreyko's arc-ending annual in this book outweighed the benefits. It is possible, returning to the other key problem with this book, that if Williams had been drawing it, he could have given the final page the kind of panache that would offset essentially pausing the book mid-thought. Instead, artist Trevor McCarthy (with, I believe, Sandu Florea) ends on a three-page panel, with each panel too large (a trend in the book) in a way that suggests not enough content to really fill the page. In the first panel, Batman, facing the reader, says, "Kate ... stop"; the middle panel shows Batwoman in the same position with no dialogue or sound effect. In the final panel, Batman and Batwoman have apparently leapt forward and are now holding each other by the throat, while Batwoman says to Batman, "No," even again as he's holding her by the throat. I do grant that the trouble here may not be entirely McCarthy's, but rather perhaps some dearth of material from Williams and Blackman when they abruptly left the book. Irrespective, the page is oddly constructed; the first two panels are meant to parallel one another, but the lack of any kind of sound in Batwoman's panel makes it seem like the character is frozen, breaking the comics page's implied animation. That "No" probably needed to be in the second panel, and this would have additionally helped the third panel. Having the characters suddenly holding one another in the third panel is a movement or two too much to accomplish in the "space" between panels two and three, especially if it's only supposed to take as long as for Batwoman to reply; with the dialogue in panel two, it'd be easier to imagine a certain time jump to what happened next in panel three. What we get instead is a stilted page that ends the book with a kind of thud. I continue to believe that the average comics reader has no sense of these creative team comings and goings, such that I imagine there would be some readers confused and dismayed by why this Batwoman book just suddenly ended. And there is no "Batwoman will return in ..."-type notice as there has been in every other Batwoman book of this run so far, which reinforces this sense of the book just stopping. That editorial disagreements caused Williams and Blackman to leave pleases no one, but I'm surprised more effort wasn't made here on behalf of the reader even if there was strife within. The art is lesser elsewhere, too (see Chapter 3/issue #20, page 10 bottom, where Batwoman is drawn nearly as a stick figure), but perhaps one benefit is that the writers' take on the characters is sharp as ever. One reason Andreyko is a good choice to follow is his Manhunter series, which was something of a precursor to Batwoman. Andreyko's Manhunter Kate Spencer was a smart, dedicated superhero whose personal life was in shambles; Batwoman Kate Kane hasn't had it nearly so bad, but she's certainly shown a rebellious dark side from time to time. In that vein, in a particularly effective scene, the writers have Kate tearing apart her family for a variety of betrayals real and imagined, and Kate's fiance, Gotham detective Maggie Sawyer, calls Kate on her hypocrisy and pulls Kate off her pedestal. It's a moment that shines a light on the title character's bad personal actions, and I appreciated the writers' reminder that Kate is fallible. In another such moment, Kate, scant hours before an important mission but guilty over accidentally dosing Maggie with the Scarecrow's fear toxin, does herself with the toxin to atone. It is both wonderfully self-sacrificing and ridiculously overwrought and unnecessary, the kind of bullheaded move that's fantastically enjoyable from a character like Kate. As a superhero, Batwoman is incredibly capable, but she's even more endearing when the writers demonstrate that, like us, Kate doesn't always have her emotions worked out and sometimes makes wrong or reckless decisions. We can't get the same from Superman, and this distinction makes Batwoman greater, not lesser. Much as I enjoyed Batwoman Vol. 3: World's Finest's Wonder Woman team-up, I'm very glad the fourth volume allowed the focus to return to Kate herself. I am not completely sold on the writers' presentation of Flamebird Bette Kane, now Hawkfire, but I do like Team Batwoman as a concept -- Batwoman, Hawkfire, Maggie, and Kate's father, Colonel Jacob Kane. Their current mission under duress from the DEO is to discover Batman's identity, and specifically I like that first of all, they don't know who Batman is, and second, they're willing to try to find out for their own ends. In the Bat-universe there's a good amount of teeth-gnashing about living up to Batman's example or what's Batman's emotional state or how he's let his sidekicks down this time, all of which is well and enjoyable, but it's quite refreshing to see a group of Bat-characters not so drawn to Batman's aura and even working at cross-purposes against him. I haven't cracked Batwoman Vol. 5: Webs yet, but I'm hoping to find Andreyko's annual right at the front (even if it wasn't published so quickly) to at least offer some semblance of conclusion before the next story. A creative team switch is tricky, and I'm also hoping Andreyko tries to glean where Williams and Blackman were heading; let's not overlook Jacob Kane's revelation, "I think I have a son," as bizarre as that might be if he means who I think he means. At some point, too, someone needs to explain what the relation is between Batwoman Kate Kane and Batwoman Kathy Kane, who as of Batman, Inc. both exist in the New 52; I had thought Jacob was married to Kathy, but in Blood is Thick she's identified as Catherine, and though she takes a larger role, it doesn't seem she has any prior superheroing experience. I wasn't sure if this was retroactive continuity on Williams and Blackman's part, or if it had been addresses or re-adressed some time earlier. Ultimately, there is a Batwoman book in Batwoman Vol. 4: This Blood is Thick, but it's hard to find around the book's construction. I can't imagine someone finishing the third volume wouldn't want to read the fourth, but I wouldn't argue with the idea that stopping at the third makes for a better conclusion. I value, without a doubt, JH Williams and Hayden Blackman's run on Batwoman, following admirably from Greg Rucka's original, and at times this has certainly been one of the best books of the New 52. That their last volume was not so great is a shame, but maybe makes the parting a little easier to take. "I haven't cracked Batwoman Vol. 5: Webs yet, but I'm hoping to find Andreyko's annual right at the front (even if it wasn't published so quickly) to at least offer some semblance of conclusion before the next story"
His Batwoman annual is my vote for worst single issue of 2014. It is absolutely a terrible conclusion to Williams' story, and he gets every single character completely wrong. I have actually started reading Webs and I don't dislike it as much as you seem to have. I hope you'll stop back and go into more detail about how the characters were wrong, etc., in the comments of that review; I'm curious to hear what you thought in more detail. The Webs review should be up next week. But my main problem was really how he wrote Alice/Beth...just as a Harley Quinn knock off or something. I dropped his run after reading the Annual as it seemed clear to me he had no regard for the story or characters set up before him. I tend to disagree with the notion that most readers don't care about creative team changes. Readership has shrank so much and coverage has increased so greatly that fans are typically aware of change, especially with a big scandal like Batwoman's creative change. That controversy made it onto other media sites as a major headline. Admittedly my evidence is largely anecdotal. I guess the first question would be, do the major comics companies sell more comics in actual comics shops or from bookstores and online sites? If bookstores, I believe if you ask an average bookstore customer who maybe pops into their local bookstore every once in a while and picks up a graphic novel, my bet is that they're not aware of the internal goings on, they're just following a series. That's one reason I think these controversies don't concern publishers all that much; I don't think it touches the bottom line, ultimately. But again, that's just my unsubstantiated sense of it. I don't think the end of the volume had anything to do with a lack of material written by Blackman and Williams. Wasn't it reported that they had the next issue finished, but it simply wasn't published because of the ending and the fact that DC wanted to move on quickly to the new team? Also, the abrupt ending had been done before in Volume 1, with Williams illustrating. I don't have it in front of me, but I want to say it was issue 2 or 3, where Batwoman was suddenly swept up into the water at the end in a very unsatisfying sequence, especially visually, It seemed crammed into an overly-small space with a distinct lack of dialogue, so it maybe it is just a shortcoming in the duo's storytelling? Speaking to your point about endings, I think there's a difference between how an issue ends and how a collection ends; granted that's a point more important to a trade-waiter than someone reading the individual issues, but I can confirm that the New 52 Batwoman Vols. 1, 2, and 3 all had very definite endings, and of course the "Batwoman will return" notice; Vol. 4 is definitely a departure from that. I really would love to know EXACTLY what JH Williams and Blackman were planning to do with Bones in this arc. They'd been building Mr Bones as this shady government spook who had a Batman fixation as far back as even the short lived Chase series. Here this seems like the culmination of all of Bones' insanity and obsession. He'll unmask Batman and solve things once and for all. I can buy him digging up Alice as a carrot for Kate and the family, but what the hell was the idea with this Bones being part of the Kane family thing? It's thrown in as some weird background tic and even Kate's dad admits that "I may have a son" implying that SOMETHING happened. But in the hands of Marc Andreykos, Bones goes full on crazy and starts ranting about how "I'm your only son!!!" and is then abruptly dismissed with the half-hearted explanation of "Oh Bones was crazy I guess. Yeah he ran the DEO and was kind of weird but turns out he believed he was part of the Kane family for some reason. Weird right?" For what's it worth I think Bones is a great character but tying him into Kate's family was a step in the bizarre that I found more off putting than even turning Croc into a hydra. I would love to know what the original plan here was. You bring up something I was trying to get at, too. If it was just that Andreyko came up with Bones's crazy obsession on his own, then we could dismiss it as the first faltering steps of the new creative team -- but, Bones-as-Kane's-son originated with Williams/Blackman, so what seems like an untenable idea was indeed "according to plan," as it were. I'm curious what was intended, too. Can't say I minded Killer Croc as a hydra -- he got better, so no harm, no foul, right? Oh yeah, I don't necessarily blame Andreyko for turning Bones full on crazy. Williams/Blackman painted him into a hell of a corner and the only way out was making Bones a full on lunatic. The shame is, even though the plot point is kind of dangled there in this trade, Bones himself doesn't act that differently. He doesn't mention it to anyone and without any internal monologue we have no clue as to whether he even cares that much. It colors his interaction with Kate and Alice in a subtle way so much so that the easiest explanation could have simply been that Bones is just making weird stuff up to mess with the Kane family. That seems way more in his MO than going full on psycho.